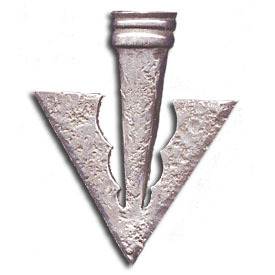 The Pheon is a heraldic arrow or spear head. It is used to denote dexterity and a nimble wit; readieness for battle. The pin measures 1.75" x 2.2" and is cast from lead free pewter. The back features a solid brass joint and catch pin to ensure the brooch will stay in position.